At Vo5 we believe hair shouldn’t be dull, life shouldn’t be boring and you should never restrict your self expression. Vo5 Matt Clay is ideal for creating sculpted texture with a choppy matt finish. The Vo5 moulding clay: is great for short cuts and easy to work in. Adds texture and definition and gives control. Gives hair a matt, non shiny look. Hold level: 5/5 Vo5. Matt Clay is a versatile product and is ideal to create either daytime or evening styles. Work a small amount of Vo5 Matt Clay between your fingers. Run fingers through hair and style into desired shape for great hair definition. Style tip: use sparingly, a little goes a long way. Add more product if needed. 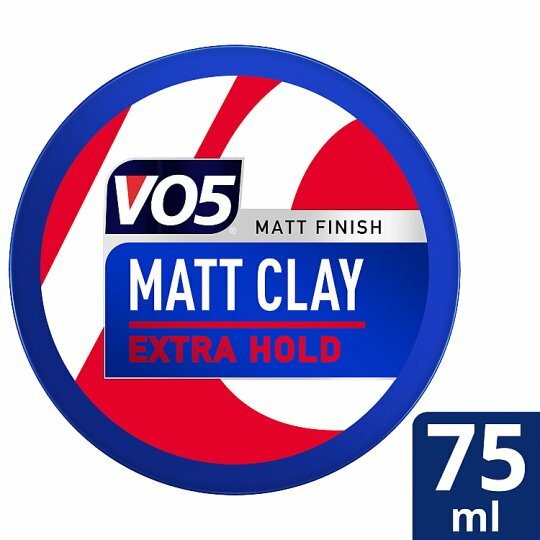 If you liked Vo5 Matt Clay, be sure to check out the other Vo5 styling products in the range to remix your style and experiment with your hair even further! Don’t forget to leave a product review and share your best styling tips. Vo5: for hair play whatever your style. For more style and music inspiration, follow Vo5 on social. HOW TO USE: Apply on dry hair. Work a small amount of clay between your fingers. Run fingers through hair and style into desired shape. STYLE TIP: Use sparingly, a little goes a long way. Add more if needed.